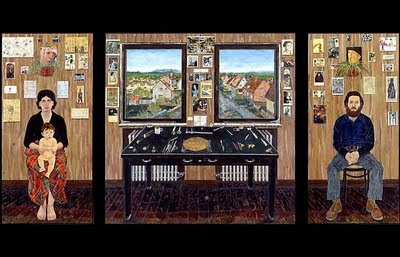 Now that the MTA is back in business consider taking your kids to the German Consulate General to see Simon Dinnerstein's masterpiece "The Fulbright Triptych." The piece measures 14 feet by almost 7 feet and, at first glance looks like a family portrait, but reads more like an homage to art as religious experience. In depicting an engraved copper printmaking plate on top of a pillow in the center of the studio work table he elevates the tool to a place of scared significance. 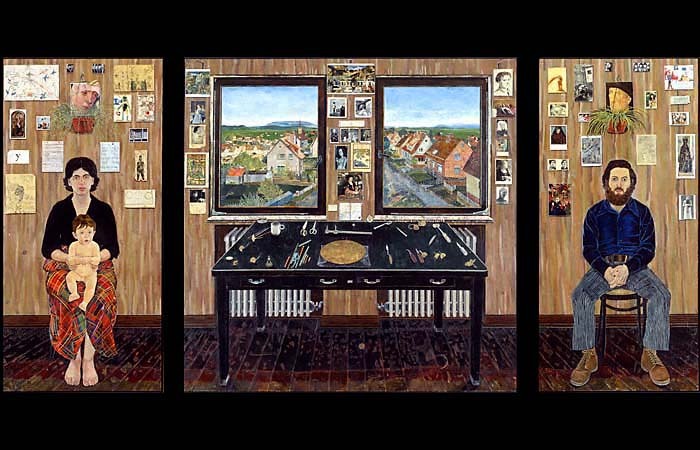 The triptych is also: a visual diary of the most important influences in his journey as an artist, an example of 1970s realism with nods to other realism styles such as trompe-l'oeil, hyper, and, folk. He began work on the triptych in 1971 while a Fullbright fellow studying the work of Durer in Kassel, Germany. The piece was completed in his Brooklyn studio in 1974 and exhibited in a solo show a year later in New York City. Dinnerstein, who is now 68, is a Brooklyn native who graduated from City College and studied drawing and painting at the Brooklyn Museum School. This was his first exhibited piece and his most famous. The Consulate is open only during the week so take advantage of the last few weeks of summer to experience this piece. Perfect for all. "The Fulbright Triptych" is on view from Monday through Friday, 9 a.m. - 5 p.m. till March 15th, 2012. The German Consulate General, 871 United Nations Plaza, at 49th Street, Manhattan.